A bath, counters and some shelves. The counter and shelves are Restoration Hardware inspired. 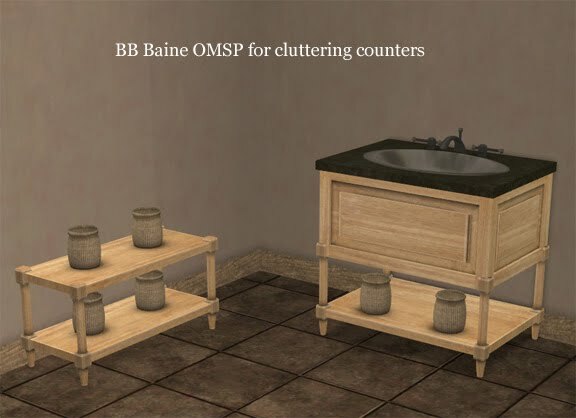 Shelves have deco slots and the two tier omsp can be used by itself or with the invisible recolour to clutter the counter set. 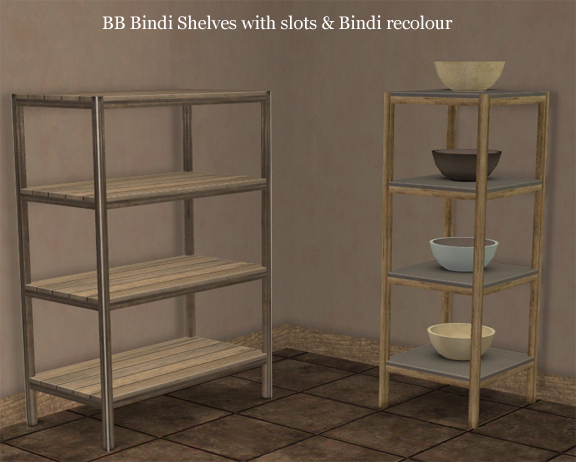 On the subject of empty shelves I made a couple to go with my Bindi set, slaved to the coffeetable with an extra recolour. All shelving will be found in surfaces/shelving around the 250 simolean mark (I think). Enjoy. All I can say is that I love you. The sets look beautiful and I can't wait to spread them throughout my game. Thank you very much. Love the set, the bath and sink are fabulous. Thank you! Thanks Nat, these look really nice. 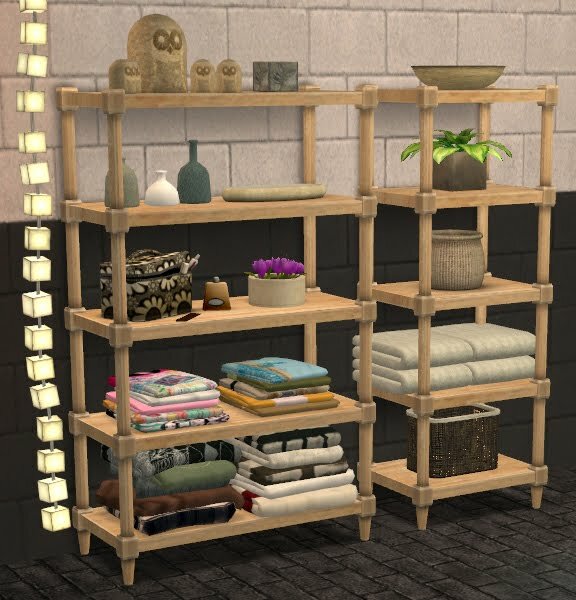 I especially love the shelves. Great work. Thankyou ! Thank you very much. I love them all! It's wonderful, thank you very much, I love all your creations and I think you're soooooo talented and awsome! Excellent as always. Thank you for sharing your wonderful work. Thank you for a beautiful set. Your wood textures are wonderful and make evrything look very real. beautiful awesome genius! thanks a lot for sharing! Thank you so much. I love your work, it is such fabulous quality. 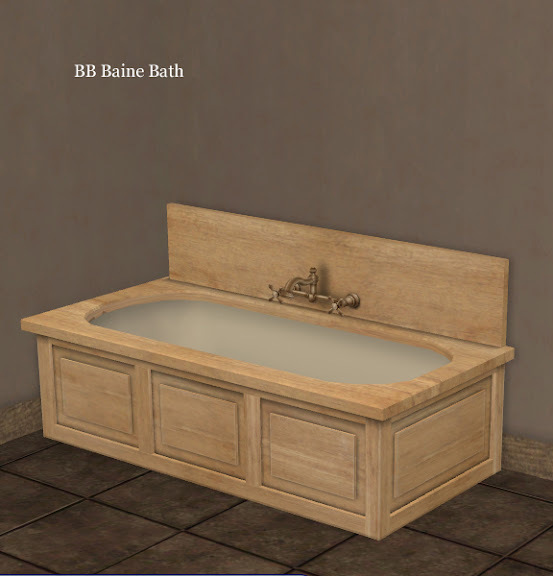 I think the bath and sink are just so lovely. thank you. I *love* you! Thank you! I love your sets and the textures are amazing. Thank you. I love your creations! Super set. Very interesting set. Thank you very much for your creations. I go away for a few days, I come back home and find all these delicious items, thanks Nat, they are gorgeous, love you, big hugs judith. The bath is beautiful, thank you! Thanks, That's excellent. Any chance of a matching sink and toilet? Gorgeous! You have such an eye for detail- I am Le Jealous! Oh my goodness. These are fabulous. Thankyou, thankyou! I may make a matching sink but a loo doesn't really do anything for my meshing mojo. Never say never though. This set is really fantastic, but then again everything you make is fantastic. Thank you so much for all the beautiful things you make for us. This set is so beautiful! And the wood textures are perfect as usual. Thank you! 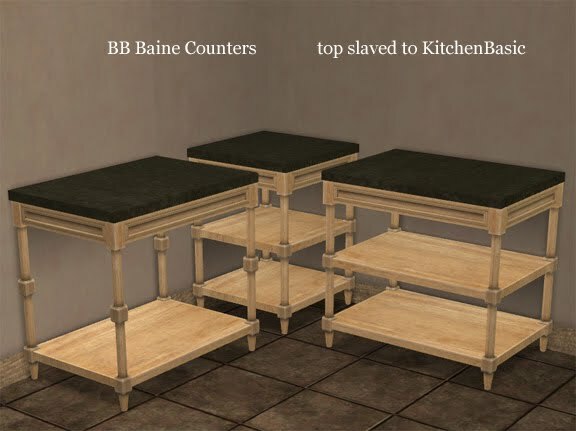 plus one can never get enough matching shelves and counters..
Only the countertop is slaved to Kbasic, the bottom has it's own set of colours as it would have required a HUUUGe amount of work to slave it. These are gorgeous and so useful. Thank you very much! is this for sims 3? Would it be possible to make a Pets version of the bathtub, please?